The Blood: The Last Vampire property is one that, funnily enough, refuses to die. There was the original feature film, then the ‘Blood+’ anime series, then the live action film and now Blood-C, a series that at first appears to be only tangentially related to the original anime. Saya Kisaragi is your normal everyday schoolgirl living in a small town in Japan. Her father is the priest at the local shrine and she helps him maintain the grounds after school. Oh, and once night falls she takes up her sword and goes out into the woods to slay hideous demons known as Elder Bairns. So far, so ‘Buffy the Vampire Slayer,’ right? Within a couple of episodes, it’s clear that there is something more at play here. But like an image only seen out of the corner of your eye, the truth about Saya and the town in which she lives is left tantalisingly out of reach. Whilst the first episode on its own may seem similar to the likes of Buffy and similar shows, there’s more than a little of ‘The Twilight Zone’ here too. 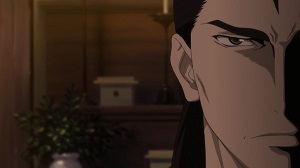 The slow reveal unfolds as a brilliant pace throughout the 13 episodes, and by the end I was thoroughly satisfied – a rare occurrence with anime TV shows. Bubblegum Crisis: Tokyo 2040 and even the brilliant Gosick dropped the ball right towards the end, whereas Blood-C goes from strength to strength. This is easily the best anime TV series I’ve ever seen. Everything about it is perfect. The music, courtesy of Naoki Satō, is wonderfully haunting. The animation is beautiful to behold, and looks stunning on Blu-ray. The character designs come courtesy of the design group Clamp, and whilst the Saya and her friends are absurdly long legged, there’s a kind of grace about them. The movement is fluid and not once did I find that the animators had skimped on quality. Most of the episodes fall into a steady rhythm of ‘regular day at school followed by kick-arse fight’, but each scene is so wonderfully directed that this never becomes boring. The series also features some of the most amazing fight scenes I’ve seen in years. Be warned, however: this is one very bloody show. It’s rated MA here in Australia but I would have considered it deserving of an R. The human deaths are astounding in their brutality, and never less than shocking. The good news is that this series succumb to the creepy habits of other anime shows. After ‘Strike Witches 2‘, I wondered if there was any anime that didn’t objectify schoolgirls. Thankfully, Blood-C avoids this entirely. There are a couple of blink-and-you’ll-miss-them moments of “wait, why did that character just grab Saya provocatively?”, but they are almost an afterthought. Most importantly, Saya is – by the end of the series, anyway – a strong character that doesn’t exist solely for the gratification of the viewer. I really cannot sing Blood-C’s praises enough. This is a brilliant mystery/horror/action series, and one fully deserving of your attention. It would help if you’d seen Blood: The Last Vampire beforehand, but don’t expect to understand how the two are related for quite some time. A true re-imagining, Blood-C pulls no punches and is a stunning piece of work. A must for anime fans. 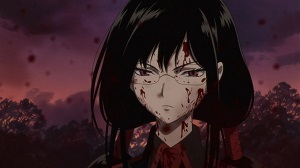 Blood-C is available now on DVD and Blu-Ray from Madman. This entry was posted in TV Series and tagged Action/Adventure, Anime, Horror, TV series, Vampire by Stuart Wilson. Bookmark the permalink.